I love a good salad. Especially in the summer. 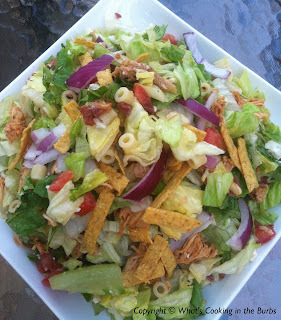 I'm always looking for new ways to prepare them and this BBQ Chicken chopped salad isn't your regular old chopped salad. I decided to use a lot of the ingredients that are in a Portillo's chopped salad (If you haven't had Portillos you are missing out!) and toss in some BBQ Chicken and drizzle it with a sweet onion dressing. Pure heaven! Toss cooked chicken in BBQ Sauce. Set aside. Wash and dry the lettuces. Finely chop into small pieces. Put into a large bowl. Add remaining ingredients, except dressing and combine well. Serve dressing along side, or pour on and combine just before serving. Enjoy! We love chopped salad. Can't wait to give this a try! Oh my gosh. This sounds delicious! As always, everything you post is delicious sounding. This salad is right up my alley and I can't wait to give it a try. Thank you for sharing on the BBQ Block Party! This looks so tasty! I'd probably leave off the Gorgonzola, though, because I'm not a huge fan. Bridget, this is a wonderful salad and so full of flavor. Hope you are having a great summer weekend and thank you so much for sharing with Full Plate Thursday.